The Parsons family won the La Primera Del Año Derby for the second year in a row after even money favorite Terrific First Down cruised to a length victory in the 400-yard race on Saturday at Los Alamitos. Owned and bred by the Parsons Family Limited Partnership and trained by Chris O’Dell, Terrific First Down broke sharply from post number seven with Eduardo Nicasio up and eventually took the lead over J. Garvan Kelly, Nancy Yearsley and Lloyd Yother’s Symbol Of Faith. The two talented fillies separated themselves from the rest of the field with the filly by FDD Dynasty crossing the wire first in a time of :19.803. Symbol Of Faith was a clear second from there and finished a half-length ahead of third place finisher Stel A Gambler. For the Parsons, the good times just keep on rolling thanks to a slew of top fillies and mares. In 2018, the Parsons Ranch’s A Political Lady won the La Primera plus two other stakes races. Earlier this year, Terrific First Down’s older half-sister, Thermonuclear Energy, won the Grade 1 Charger Bar Handicap after scoring a pair of stakes wins in 2018. Led by the accomplishments of those two distaffers, the Parsons Family were honored with the 2018 Pacific Coast Quarter Horse Racing Association Breeders Special Achievement Award on January 24. 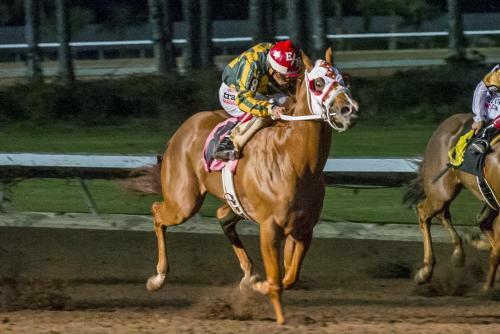 A Political Lady joined her connections as champion after being named the 2018 AQHA and PCQHRA 3-year-old filly of the year. And after winning this year’s La Primera and also running third against males in the Grade 1 Los Alamitos Winter Derby on February 9, Terrific First Down has positioned herself as a top contender in this year’s 3-year-old filly category. In addition to her fall in the barn, Terrific First Down has had her moments in the starting gate. Terrific First Down earned $88,200 for the win to take her career earnings to $130,629. This was her fourth win in 10 career starts. On Sunday morning, Jay and Char Parsons will head back to their ranch in Sanger, California, back to taking care of their horses. Ridden by Carlos Huerta for trainer Juan Aleman, Symbol Of Faith earned $35,700 for her second place finish. The homebred filly by Tac It Like A Man and out of Answer The Dream has fifth in last year Grade 1 Heritage Place Futurity. She also qualified to the Golden State Million Futurity here last year. She’s earned $171,852 in her career. Dr. Steve Burns owned the third and fourth place finishers in this race. Stel A Gambler earned $25,200 for running third, while stablemate You Caught My Eye earned $14,700 for fourth. Mike Casselman saddled both fillies. No Telling, Anas Image, Favorite Wise Lady, Jess Motions and Always Dreaming completed the field. Chris O’Dell was moving slow in the winner’s circle area on Saturday. And there was a reason to it.